The space begins with the solid bold wall that hides all the enriching and potential opportunities.Initially the pot of requirement was to retain the visual of quietness and optimize the separation of the house.However my acupuncture point in this house was to connect the enclosed area into a brand new visual of quietness. By doing these, certain historic and raw charm is being restored to shelter the emptiness of the house. The approach was to exceed the ugliness into the beauty of modern touch. The new accommodation concludes with a surprise of interior within an interior; dry & wet Kitchen within a kitchen and dining within a kitchen. The living space was also interrupted by an impressive art attack that has soon become the electrical wiring personal housing. To complement the overall emphasis, slices of warm light are required to stain across all colour walls. Eventually this has created a sense of attractive entry point. 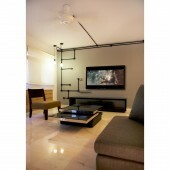 DSOD is a creative interior design consultant firm established on 2012. Feeling the pulse of a new era, design moves in a fast pace but not forgetting the foundation. We strongly believe in injecting life to an empty space. At DSOD, we communicate and understand the pot of ingredients and further input our expertise advice in the design. 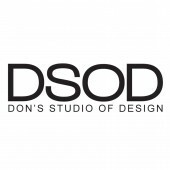 The design we provide at DSOD is always unique with its own character and always giving opportunity to change the feel of an empty space that is ever-lasting. We also believed the strong connection between the quality of design and the quality of life. Good design is eternal and same for life it should not be compromise. 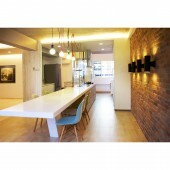 Chua Chu Kang House Interior Space by Don Lin is a Nominee in Interior Space and Exhibition Design Category. · Click here to register today inorder to be able to view the profile and other works by Don Lin when results are announced. Chua Chu Kang House Interior Space by Don Lin is Winner in Interior Space and Exhibition Design Category, 2013 - 2014. 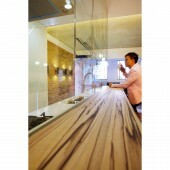 · Read the interview with designer Don Lin for design Chua chu kang house here. · Press Members: Login or Register to request an exclusive interview with Don Lin . · Click here to register inorder to view the profile and other works by Don Lin . Did you like Don Lin's Interior Design? Did you like Chua Chu Kang House Interior Space? Help us create a global awareness for good interior design worldwide. Show your support for Don Lin, the creator of great interior design by gifting them a nomination ticket so that we could promote more of their great interior designs.